This was written by admin. Posted on Thursday, December 6, 2018, at 8:54 am. Filed under Uncategorized. Bookmark the permalink. Follow comments here with the RSS feed. Post a comment or leave a trackback. I know Trent and Hillary, they are great people. I know for a fact that this whole lawsuit stemmed from the arrogance and unprofessionalism of BA Colleen Connolly. Another financial hit to the taxpayers because of her ineptness. Thank God your gone. #1…Of course Colleen is to blame. She can’t leave fast enough. She’s caused so much damage and turmoil to both the residents and the borough employees. I know for a fact that 98% of the employees are happy and relieved that she’s going. Thanks Colleen and Matt, your actions continue to cost the Belmar taxpayers. Trent and Hillary are two of the nicest people you will meet. The way Belmar and it’s BA treated them was disgraceful. Belmar should feel lucky that’s all the settlement was. Thank God Colleen’s gone. Speaking of Colleen Connolly, did anyone read Jim Bean’s letter to the editor? He makes a really good point! Also Jim McCracken has a letter as well. good reading. Wow. 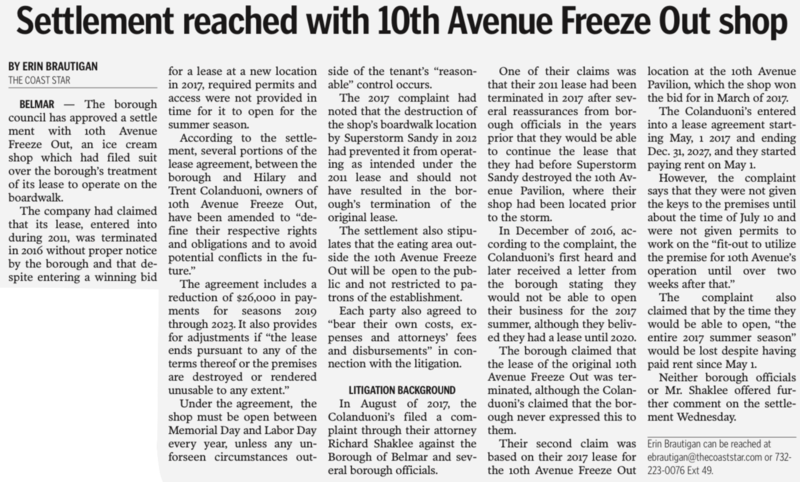 I don’t think the original 10th Ave Freeze Out lease was terminated in December of 2016 because of ineptness. If the Borough had honored that lease, it would also have had to honor the lease that Jake’s Crab Shack had for the concession area in the Fifth Ave Pavilion. 1. The Borough set a disproportionately higher minimum bid price for the 5th Ave Pavilion ($8,000/month for 1,300 sf and 1,250 sf of outdoor deck space) compared to the 10th Ave Pavilion space ($4,000/month for 800 sf and 1,000 sf of outdoor deck space). Yet, the “Use of Property” language in both leases is identical: “The Tenant agrees to use the Property only for the purpose of sale of food products, beverages, ice cream, frozen yogurt, frozen food products or other dessert products.” There is no mention in either lease, or in the notice to bidder ads published by the Borough, that the Fifth Avenue Pavilion concession space could be used to cater events in the Fifth Avenue Pavilion. 2.The only bidder on the Fifth Avenue space was the owner of Merri-Makers. He submitted a sealed bid of $9,100 per month, and described the food to be served as “Boardwalk food, beverages & snacks.” (There were two bidders for the 10th Ave pavilion space: 10th Ave Freeze Out, which won with a bid of $6,111 per month, and Jake’s Crab Shack, which bid $4,500 per month). Ken, thank you for educating the residents of Belmar on how things worked under Doherty. Hopefully other people look into the whole mess that was the Doherty Administration. Did they ever find those gift cards ??? 3. The Borough had never in the prior more than 25 years (and likely for far long than that, if ever) used sealed bids to bid out boardwalk concessions. All prior boardwalk concession leases had been awarded at public auctions during which bidders bid against each other. 4. At the March 21, 2017 meeting of the Mayor & Council, the lease for the 5th Ave Concession was awarded to M2 Concessions, LLC , which was a new entity formed by the owner of Merri-Makers. 5. Two weeks later, on April 4, 2017, the Mayor & Council adopted Resolution 2017-19, which established a new schedule of Fees for Public Spaces. There was a new fee added for “Wedding/Event Package: Reception & Bonfire” for a “Full Taylor Rental with Bonfire,” the application fee was $100.00 and a Facility Fee of “$1,500 (includes fire permits and eight hours of facility usage)” and a Security Deposit of $500. 7. Less than 6 weeks later, Merri-Makers began advertising weddings at the Taylor Pavilion on their Instagram account. One photo dated May 27, 2017, shows a staged photo of a bride sitting on an outdoor bar on the beach (with a sign that says “Rum Bar”). I wonder how much rent this concession space would have drawn if Colleen Connolly and the Borough had publicized in advance to area catering companies that the successful bidder would be able to cater weddings and other events on site — complete with beach bonfires — for only an extra $1,600 per event? Where are the Monmouth County Prosecutors? Campbell, if he and his sons cared would refer this article for investigation. Can the new administration change the rules for booking the pavilion and is it possible to legally break the lease with Merri Makers based solely on this bogus deal ? If the new Mayor and council read this blog please boot Merri Makers out of the pavilion and let the townspeople enjoy it again!!! Wouldn’t it be nice to have rocking chairs inside to look out at the ocean? How about bringing dance nights back, like the old square dancing they used to have there. I believe the answer to #12 is found in the several comments that Ken posted. The rules are not part of the lease agreements. MM has no right to require that these rules remain as they exist. The borough may change these rules if it is done in compliance with whatever statutory or municipal codes and procedures apply. A change as simple as prohibiting one entity or individual from reserving more than one date during a given time period would seem to eliminate the most egregious aspect of the current rules.However there may be other changes that are also desireable. About #6-Why is Jim Bean referring to himself in the third person? #16 Why? Because he is an above average person. If you know Jim Bean, it is all about the humor! I can hear him in my head saying it too. Great letter and appropiate for this post! Prior to the bid I heard on good authority that Brandls was told not to bother bidding on the fifth ave pavilion. He then bid a pretty low ball on 10 th ave, I wonder if they were tipped off. I additionally heard the 10th ave didn’t hand their bid in until very late in the day, on the day of the bid. #7 the only problem with that if Brandl would have been allowed to return to fifth ave pavilion based on the pre-sandy lease. He would have had to pay for all the improvements that building needed, would he have done so for one more remaining year? Thanks Ken for the important info! Merri Makers can afford to renew its lease even if Belmar switches to public auction. Rather than make them compete (and get big bucks) let’s preserve it and reverse the April 4, 2017 resolution’s new rules. That possible? #20 That’s interesting. I wondered why the owner of Jake’s would have gone along with having his lease terminated without complaint (other than that he and Doherty are buddies). But the fact that the Borough couldn’t terminate Exit 98’s lease explains why they shouldn’t have tried to terminate the Tenth Ave Freeze Out Lease. Unless, of course, they wanted to give Jake’s owner a chance to bid for another boardwalk concession, after they priced him out of the Fifth Ave space. I’ve sent the Administrator a page from minutes of a 7/25/2013 meeting of the Boardwalk Redevelopment Advisory Committee that I think shed further light on what was going on, and show how long this has all been in the works. If he is kind enough to post them, we can continue this debate on that string. Here is a link to the minutes Ken sent in. I’ll put more together on this when I have time. #22 – Have you sent your information to the Monmouth County Prosecutors Office also? I hope Walsifer and the new administration bring in an experienced business administrator with a degree in business administration like the CFO they hired. Also, Acting Chief Hiseman, who has taken full advantage of the residents of this town for far too long needs to go also. The first entry references a discussion as to “whether 950 sq. ft. is adequate for re-establishing a business such as Jake’s Crab Shack. No final decisions were made on this but more space seems necessary for proper use as restaurant/concession.” There are two things odd about this: First, to use #20’s point against him/her, if there was only one year left on Jake’s lease, why was anyone worried about whether Jake’s space was large enough. Second, it doesn’t seem likely that Jake’s owner was concerned about the size, because even at 950 sq. feet, he had room for tables inside, and later bid $4,100 per month for the 10th Ave space, which is only 800 sq. ft. But the original 950 sf concession area in the original Fifth Ave Pavilion was likely too small for a concessionaire that intended also to use the space for a catering business. If my understanding is correct that Cruz Cafe uses all 1,300 sf for its operations and serves boardwalk customers only through windows, then it seems more likely to me that this discussion wasn’t for the benefit of Jakes. More on the second entry to follow. This is the first time we heard about any plans to add a second floor catering facility to the Taylor Pavilion. It’s worth noting here that Merri-Maker’s oceanfront catering location in Sea Bright had been destroyed in Sandy. One other point, worth noting is that it’s not clear what the date was of the meeting these minutes are from. The date at the top of the page says 7/25/2013, but that may be the date of the email that John Hutchinson sent them. (You can see his TCNJ.edu email address in the link at the bottom of the page). But toward the bottom of the minutes, it says the next meeting date is in March, which seems unlikely if the meeting occurred in July. So who was on this Boardwalk Redevelopment Advisory Committee , and perhaps they could speak up and shed some light on the intentions of the discussions? Come on Matt you know you’ve been reading this all morning , you should explain/defend what took place. Maybe the Meatball lady will speak that is if you allow her too and defend what is being said about you and your admin.seeing how that is she has done for the past 6 years. So what does all this Merri Makers information mean? Seems like old news that the citizens were duped. What can be done about it? Jail for Doherty, Connolly and the rest of the administration? Let’s hope the new BA is someone who is qualified to straighten our mess out and not some political hack. Guess Maggie won’t let you talk ? Tip of the iceberg buddy.Cant wait to see the amount of money your self serving administration is going to cost the town my guess is it would buy a lot of Meatballs . Frivolous I think Not. Meatballs this is where blind faith gets ya enjoy. #33. New BA is a political hack. #33 do you mean a well qualified BA at work after discussing it with whoever becomes the new boro attorney? with a view towards new rules and options on how to proceed with a referral to MonCtyPros or a civil action regarding the lease? my view is that if the rules are changed as was suggested previosly the lease , if strictly enforced , will be most beneficial to the boro. it’s a little late to go back to square one and rebid and redesign the whole deal. of course this assumes no one is on the wrong end of a criminal action from the county after this is all reviewed. Who dat? has a new BA been named? #35 Why would you announce that #33 is a hack? Do you know him or her? Do you have proof of your allegation? It is best if you know what you are talking about. Mayor Walsifer? Think before you speak. I heard my sister, Colleen, recommended me for the new position. #33 how dare you speak of me like that! #31-I can tell you from personal experience-Matt NEVER tunes into this blog. Never has, and never will. #41 what are you babbling about? And why do you bring up his family? Talk about anger and unhappiness, look in the mirror! Leave you commenting to the subject matter and stop personal attacks. Jeez, how low. Thank you, Ken, for all your work and detailed explanations. Who decides if something goes up for public bidding or in sealed envelopes.